With the record King salmon weighing in at 97lbs, 4oz, they are known for their sheer power and explosiveness to strip line from your reel. When battling a fierce Chinook, you might find yourself chasing the monster a few corners down or up stream. These fish do not like to be hooked. Their relentless strength will amaze you as you watch the giant fish surface near your boat, only to splash and drench you with water as it takes off again. It is not uncommon for a fight with this glorious fish to last 15 minutes or more. Their teeth are very sharp and can cut through your line during the fight or they can make your lure unusable after they leave their mark. All Alaskan fishermen long for the fight that comes with the greatest of all salmon. Although Alaskan silver salmon are smaller than the mighty Chinook, averaging from 7-15 pounds, the fight you will get with is anything but disappointing. These are the most acrobatic and active salmon of the five species. Their performances in the water will amaze you. These athletic Coho parallel Michael Jordan in their jumping ability and quickness. They will fight until the very end. Silvers are fairly easy to catch. Even a fisherman with little experience can hook into one when a school of 15 travels past. While sitting at one particular fishing hole, one can expect to see the ripples of these schools go by several times an hour. The use of salmon eggs later in the season allows for an even easier advantage when hooking these fish. Pink - Pinks run through the Little Sue every other year and are quite abundant. Their schools are the largest among all the salmon species and can be found hanging out in their holes. They are fairly easy to catch and mostly caught using spinners. Chum - Chum salmon are the second largest salmon in size. They are not as acrobatic as the silvers but put up a pretty good fight. They run every year and are unmistakable with vibrant tiger stripes along their side. Reds - Alaskan red salmon have the best meat for eating but catching them is a different story. The limited numbers that run on the Little Su don't like to bite at lures. They are plankton eaters and don't respond the way other salmon do to lures. Sometimes on the river you will see fish rolling and jumping in a hole, you go over and fish there but you can't seem to hook anything. Chances are your efforts are being ignored by these 6-8 pound fish. Rainbow Trout & Dolly Vardens - The Little Susitna is generally known for it salmon runs but you can find some other fish swimming these waters. Rainbow trout in the Little Sue average 12 inches in length. Usually you will catch one while trying for kings as they follow the fish up and mistakenly bite at your lure. They are looking for salmon eggs and are also caught in silver season when using bait. Late in the season you can see the Rainbows trailing the salmon as they spawn waiting to eat their eggs. Dolly's are very rare but can be seen and have been caught when using eggs for silvers. 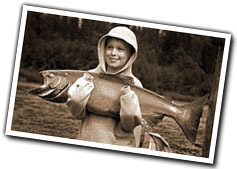 To learn more about Alaska Salmon visit the Alaska Department of Fish and Game.